11039 East Colonial Drive Suite E, Orlando, FL 32817 however, we cater to most of Florida. We cater to your needs! The most popular are yellow, marble, chocolate, amaretto, almond, lemon, coconut, red velvet, strawberry, key lime, funfetti, and watermelon, raspberry, pineapple to name only a few! Carrot will be an extra charge. To name a few fillings, we offer: butter cream, chocolate buttercream, strawberry, red raspberry, banana, Bavarian, chocolate Bavarian, coconut, guava, lemon, pineapple, coffee, cookies and buttercream, peanut butter, nutella, carmel. Cream cheese will be an extra charge. We deliver cakes in the Central Florida area; delivery fee is determined by distance and set up. What do I need to lock-in my Wedding Cake? We require a 50% deposit up front, the balance of a Wedding Cake is due (3) weeks prior to delivery/pick-up. A tasting appointment is recommended as soon as possible. With your tasting, you will have the pleasure of tasting 3 cake flavors and 3 cake fillings. If you have a theme chosen, a color swatch or palette or pictures of cakes that you love, feel free to bring any and all details to the tasting. At the time of the tasting we will ask how many people are planning to attend in order to correctly size your cake(s). What do I need to lock-in my Custom Cake? We require a 50% deposit up front, the balance is due at time of cake pick-up. For birthday and special occasions, we require a theme, color palette and/or picture of a cake you would love, e-mail us the picture or bring it in. We will use the provided picture and the number of people you will be serving to quote your cake(s). What is your credit card policy for custom cakes? Do I need a tasting appointment? An appointment is required, once you set up a date and time, you may choose 3 cake flavors and 3 cake fillings. We will always try to accommodate our customers however we cannot promise availability of certain flavors or fillings in the event of a walk-in.Also, during an appointment, we set the time aside to go over as many details as possible to create your perfect wedding cake. Once money is put down on the cake, there are no refunds; however, we will always work with you, credits must be used within one calendar year. Please understand, especially for weddings, we hand make items ahead of time so that they set, dry or harden, and cakes are baked fresh for the day of the event; in the event of a cancellation, please contact us as soon as possible so that we may coordinate accordingly. How much time do I need before an event to place a Wedding Cake order? It is best to schedule a Wedding Cake as far in advance as possible. For Wedding Cakes, three months is preferred notice however, we will work with you and make things happen! Our customers come first and we will always try to accommodate you. Quality wedding cakes take much planning and coordination, we promise to always do our best! How much time do I need before an event to place a Specialty/Custom Cake order? Custom cakes for events such as birthdays, baby showers and more, we ask that you contact us one week in advance. We can accommodate last minute orders however the more time we have, the better we can plan, customize and create! We ensure every cake is a HIGH QUALITY cake, please ensure prior notice so that we can make your cake(s)! How much is a Custom/Specialty/Wedding Cake? There are many variables such as design, size, colors, handmade items and pick-up or delivery planning. Our prices are reasonable, we will quote you based on picture references provided. We are aware of some peoples allergies and we want you to know in our bakery we use peanuts, soy, milk etc. Your food may come in contact with these. What is your shipping policy for supplies? All supplies that are not local pickup are shipped through USPS. Processing is handled on the same business day if orders are placed before 3:00 PM EST. Processing will take place on the next business day for orders placed after 3 pm EST. Call to inquire about international shipment details. All cake decorating supply customers will receive an e-mail when item(s) are shipped out, this e-mail will provide a tracking number. Do you deliver any supplies? Supplies are not eligible for delivery but most supplies are eligible for local pickup at our retail shop. Supplies that are unopened may be returned within 7 days after receiving them. Buyer is responsible for paying for shipping product back, there will be a 20% restocking fee. Seller is not responsible for items damaged in transit or in the buyers possession. Same Day Shipping on an order means that the order will leave our store the Same Day! Cutoff time for item out of store same day is 3p.m.! Actual estimated time of arrival for an order depends on the shipping method selected at time of checkout. All cake decorating supply customers will receive an e-mail when item(s) are shipped out, this e-mail will provide a tracking number. 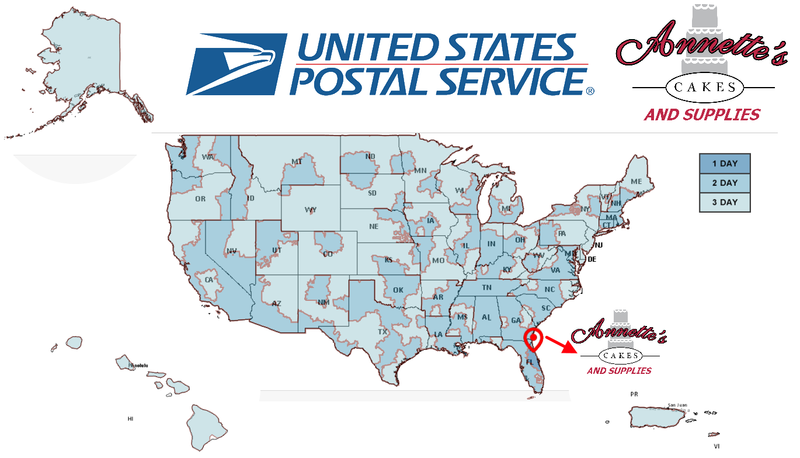 Below is a map of approximate shipping times! Practically everywhere! We provide Worldwide Shipping! International Shipping times may vary. All cake decorating supply customers will receive an e-mail when item(s) are shipped out, this e-mail will provide a tracking number. NORTH AMERICA: Anguilla, Antigua & Barbuda, Aruba, Bahamas, Barbados, Belize, Bermuda, Bonaire, British Virgin Islands, Canada, Cayman Islands, Costa Rica, Curacao, Dominica, Dominican Republic, El Salvador, Greenland, Grenada, Guadeloupe, Guatemala, Haiti, Honduras, Jamaica, Martinique, Mexico, Montserrat, Netherlands Antilles, Nicaragua, Panama, St. Kits and Nevis, St. Vincent and The Grenadines, Saint Barthelemy, Saint Lucia, Saint Martin (French Part), Sint Eustatius & Saba, Sint Maarten (Dutch Part), Trinidad and Tobago, Turks And Caicos Islands, U.S. Minor Outlying Islands, United States. SOUTH AMERICA: Argentina, Bolivia, Brazil, Chile, Colombia, Ecuador, French Guiana, Guyana, Paraguay, Peru, Suriname, Uruguay, Venezuela. The only places we do not ship to are Afghanistan, Antarctica, British Indian Ocean Territory, Bouvet Island, China, Christmas Islands, Cocos Island, Comoros, Crimea Region of Ukraine, Cuba, Falkland Islands, French Southern Territories, Heard & McDonald Islands, Iran, Libya, Mayotte, Myanmar (Burma), Nauru, Niue, North Korea, Palestinian Territory Occupied, Pitcairn Island, Rwanda, Saint Helena, Sao Tome and Principe, Somalia, South Georgia and the South Sandwich Islands, St. Pierre and Miquelon, Sudan, Svalbard Jan Mayen Island, Syrian Arabic Republic, Tokelau, and Western Sahara. There are many excellent vendors in the Orlando area. Check out our Pros to Know page for more information.